Milflores (Mophead Hydrangeas) Luscious, abundant and impressive. At wholesale markets from New York to Paris to Hong Kong, cut hydrangeas are in a class with few peers and their notoriously fickle disposition makes them even more of a challenge for the home florist. But they are definitely worth the trouble and their recent abundance in local markets provides a stunning addition to your choice of potted and cut flowers. We have had smaller hydrangeas (locally known as milflores for their seemingly thousands of blooms) in the Philippines for many decades. They thrive in cooler climates such as Baguio, Tagaytay and some cooler regions of Mindanao. Not a native to the Philippines, the flowers of the localized plants have become smaller and smaller — though they still look stunning when massed together. The native plants are often sold at roadside stands and farmer’s markets and recent prices are roughly P75-150 per pot depending on your haggling skills. Most native plants are blue or purplish in color. Recently, a number of growers in Davao and the Mountain Province started cultivating imported hybrids of hydrangeas with simply spectacular results. Raised in greenhouses and under controlled conditions, precise potting mediums and abundant water, the growers have managed to raise plants with huge blooms in dark and light pink, blue, lavender and even some dark green. The stunning blue specimens at right were purchased at the FTI market at just P50 per stem. They were apparently cut from a very mature plant raised in the Baguio area and the owner had agreed to sell the blooms in one fell swoop. With blooms at least 10 inches in diameter, these are among my finest market finds of the year. On another visit, I found nearly chartreuse colored potted hydrangeas (actually immature flowers that had yet to take on color) at top for about P80-100 a plant which was also quite reasonable. While hydrangeas are notoriously fickle, I find they are well worth the bother. If you purchase already cut blooms or cut your potted plants, make sure the blooms get a LOT of fresh water to keep them happy. If they wilt, try plunging the entire flower head in cool water for 2-3 hours and they should recover. I find that fresh flowers last 5-6 days if well cared for. Pictures are quite lovely. Nice to read about what’s available in Manila but that limits your audience to locals. You need to develop a reason for “repeat hits” from browsers on the web. Keep going! tree. This is the type which has round fragrant leaves. Do you know of any source? I really love the Milflores Mophead Hydrangea. How can I find one? I have looked everywhere online with the name you provided and found nothing. In my continuous search for the Gum tree (eucalyptus cinerea), all shops of ornamental plants said it’s difficult to find, and that it will only thrive in cold climate, the likes of Baguio and Tagaytay.Not even the Manila Seedling bank has it. After what seem to be an endless search, I finally found 3 small trees being sold at one of the garden shops at Market Market in The Fort. I quickly bought two. I transfered them in a big pot and placed them in a shaded area. I noticed growth was slow even after 2 months. I did a little more research and found out that contrary to what I was told, they like the sun, in addition, they dont like fertilizers at all. So I placed them where they got a lot of exposure to the sun. In two weeks time, growth and development of leaves improved. They are already 5 ft in height and leaves just keep on comming. I tried preserving the leaves, and now i have a few fragrant bundles in the house. Arnel, if you have a chance, kindly send me a photo of the tree will you, I am curious…thanks! I just chanced upon your site and I;m loving it!! Will definitely be checking in regularly. May I know where the FTI market is? where i can buy milflores in only 50 pesos? From Houston, TX, we moved to North Carolina (near Jacksonville) and we stayed in the suburbs surrounded by farms and ranches. On the house we rented, we have abundant flowers and fruit trees. They are in full bloom in different periods or climate. And these hydrangeas are almost all around the town and are in their full glory around February-March. Right on our side yard (which really serves as our entrance to the house), we have 3 huges “bush”. They are so many and huge florets that I ran out of base to put them, so I just leave them in its plant. When I visited the site today, I thought I was seeing a mispelled word – you see my maiden’s surname is Miraflores – so I thought for a while – a flower and my father’s surname. I was so happy. Now I get to tell this information to my relatives. Anyway, I would love to buy this plant when I get back home. It will be like having joined 2 culture together. Just like the local Almendras (which I purchased in Quezon), they are called Crepe Myrtyle here in the States. They are both beautiful, one for spring, one for summer. I just bought my milflores, the blue one and right now i think it’s atarting to die. It has this black spots at the stem of the flowers…. hi ill like order these and import into singapore. can i have more details like where can i get them? Your writing is beautiful. You can tell that you truly love you hydrangea’s! Hydrangea’s have such delicate features whiles displayig a stunning large bloom. They are beautiful planted outdoors, used as cute flowers and displayed in beautiful vases. I love to use the blooms dries as well. I have done os many different decorating things witht he dreid flower heads. One year, I took extra special care to cut the flowers and dry them to preserve, the best I could to maintain their shape, then i spray paointed them silver and used almost 75 dried blooms and stuck them all around in a large Christmas tree and wreath. People still talk about that tree. If you have any way of selling these hydranges to fellow re-laers, we would be very inferestd in purchasing them at several times throughout the year. I have a wedding scheduled in Aug. that has requested hygrragenia’s. The pictures are beautiful. My daughter is planning a wedding in April 2009 in Wilmington, NC. 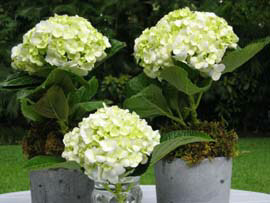 She would like to use potted hydranges for centerpieces on the tables. She also would like to use cut hydrangesa’s in her bouquet and the bridesmaides bouquets. We are trying to find the best place to purchase them. We love the two colors that you have shown in the above photos. Not sure if hydranges are cost effective during that time of the year. We are on a buget but we absolutely love the look of hydranges. i bought milflores at P50 per pot (with at least 3 huge bundles of blooms each pot) at cool Tagaytay market in the Philippines. I was afraid they might dry up as soon as we brought them down to hot, humid Manila but they have survived. There are brown spots on some of the blooms but I think they did well considering how intense the temperature gets in Manila these days. Just keep watering them at least twice a day to keep the blooms happy. I also purchased fertilizer to help the development of the blooms (pampabulaklak at pampalago). I am hoping they will continue to survive but if not, I have enjoyed the exquisite beauty of the milflores while it lasted. I will also make it a point to visit Tagaytay once in a while so I can enjoy the site of milflores. I absolutely love love love hydrangeas. The photos you have here of them are beautiful. Im planning my wedding for early next year and I really want my centerpieces to be hydrangeas in tall tall slim vases. Where would you recommend i source them from — would they be available in Dangwa or Tagaytay (where exactly?) or would I have to go up to Baguio? annie, try sourcing hydrangeas from King Louis Farms, I have a post on them in my archives. MM and Arnel, i’d like to mention that eucalyptus tree will grow near the beach, coz I planted 4of them beside my 20 coconut trees. Once they get too tall and lanky, cut them to help new branches and the damange of breaking when the typhoons arrive. So yes go ahead and plant them anywhere with lots of sun and water. I want to know if where could I purchase blue hydrengias. I need about 300 pieces of it? Is there a farm where I can order the flowers? I am from Mindanao.